Many of the cards I've been gravitating towards lately are all about gratitude. It's so easy to forget how much one has to be thankful for when life is not so easy. But just like a rainbow, emerging through the clouds and rain, so does a grateful heart in times of difficulty. And just like a rainbow, gratitude has the power to brighten a cloudy day like nothing else! Before I get to my card, I want to take just a second to thank you all for your patience with my pre-scheduled posts as these last few weeks passed by. And for still visiting this lil' blog in my absence! I apologize that I have not been able to get back to you all just yet - I'm definitely working on that as we speak. Things are a little bit better now for me health wise, so I'm going to try and be more present in blogland in the coming weeks. Thank you all so much for your support and love! It means so much to me! 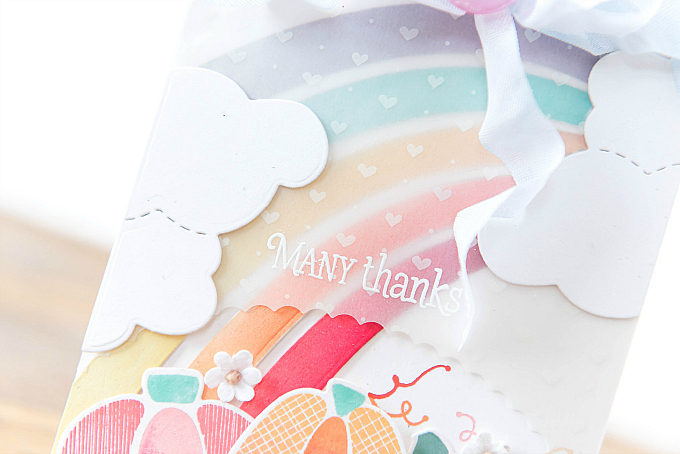 Okay back to the card - I started this lil number with Papertrey's beautiful Rainbow XL die and rainbow stencils from the Sunshine and Rainbows kit. I used colors of Winter Wisteria and Plum Pudding, Aqua Mist and Hawaiian Shores, Lemon Tart and Harvest Gold, Summer Sunrise and Orange Zest, and Berry Sorbet and Pure Poppy, for blending some ombre rays. This is my first official XL die, and I love it! I hummed and hawed over whether or not it would be versatile enough to add to my collection. So, the first order of business was to test how well it would work seasonally...And I think it works splendidly! Over the rainbow, I added a heart vellum, which I cut with an oval scallop die at the bottom. I wanted the rainbow to look like it was emerging and pushing out of the clouds, bright, bold and colorful. 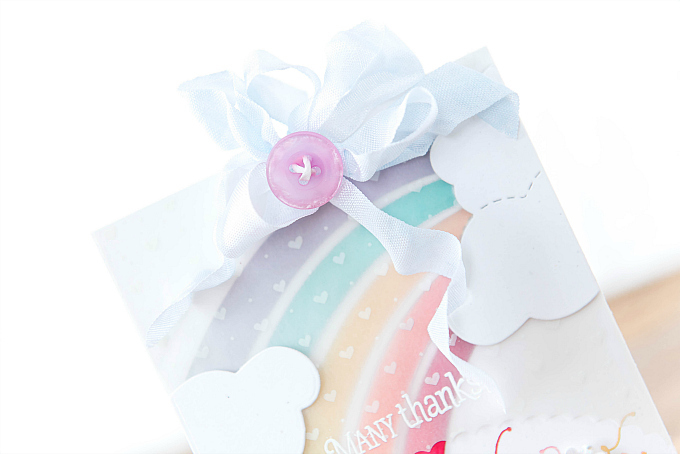 I used the clouds included in the die, and a little blue bow. These elements are all so sweet. I can't wait to play more with this pretty die and these sweet pumpkins. 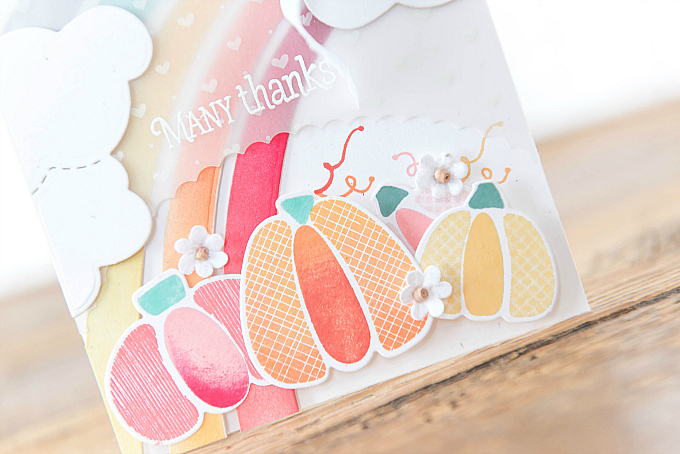 At the end of the rainbow, I stamped a variety of pumpkins using PTI's Pumpkin Patch stamps and dies, in colors of Pale Peony, Berry Sorbet, Pure Poppy, Summer Sunrise, Orange Zest, Terracotta Tile, Harvest Gold and Lemon Tart. For the tops, I used Hawaiian Shores and Ocean Tides. 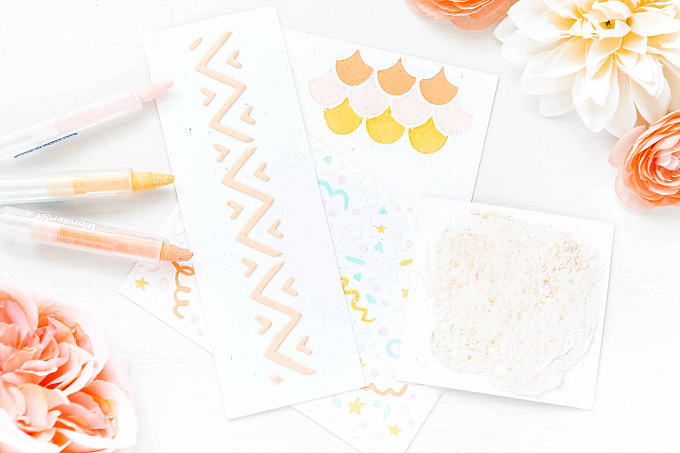 These sweet stamps are discontinued, and I haven't been able to find a good replacement suggestion, but this one is really affordable and can be multi-stamped if the stamps are pre-cut. And here is the co-coordinating die. If any of you know of any better alternatives, please feel free to leave a note in the comments. Thank your for joining me today. You are all one very big reason I am so grateful! I LOVE this pretty card. The colors you used are fantastic and I adore the little row of pumpkins at the bottom. Such a festive card!! Oh, now those are some cute pumpkins! What a treat it would be to have them on your front porch. I like your sweet heart filled rainbow too. This is a darling card Ivana! Right? We've yet to see any pumpkins hit the stores, so I'm patiently awaiting ;) Thanks so much, Lisa for your sweet notes! I'm glad you're doing better, Ivanna, & hope you continue to improve. I've been fortunate to have very few health issues, but family members have not been so lucky. When my little pains kick in I always remember how much better I am than many. I hope your challenges are soon a memory. 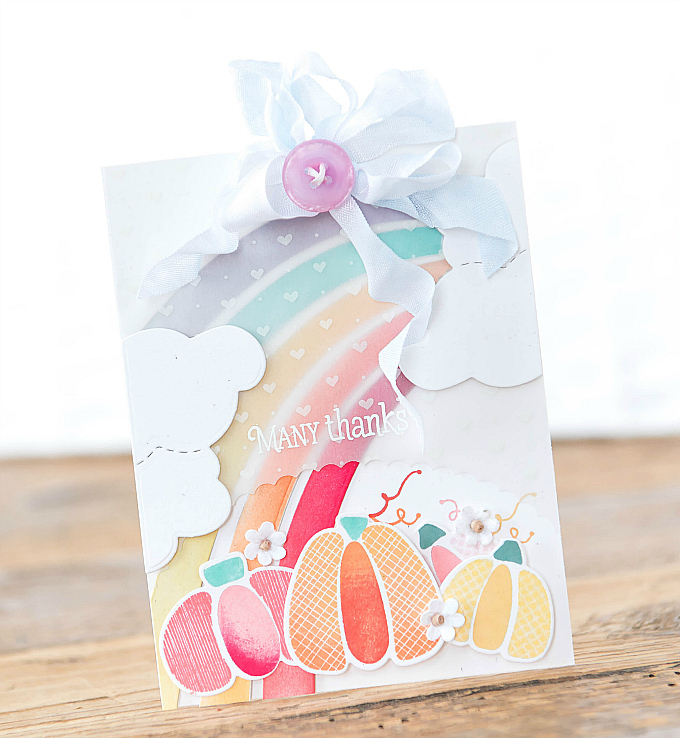 Love this beautifully designed card--gorgeous colors for the rainbow! Thank you so much, dear friend! We are very hopeful too and have lots of amazing support which has made all the difference :) I'm so sorry about your dear family members - it's so hard to not have good health to count on. I'm so glad to hear you are healthy and doing well, though! I hope you are also having a wonderful Autumn and enjoying many, many crafty days! Sending you big hugs!